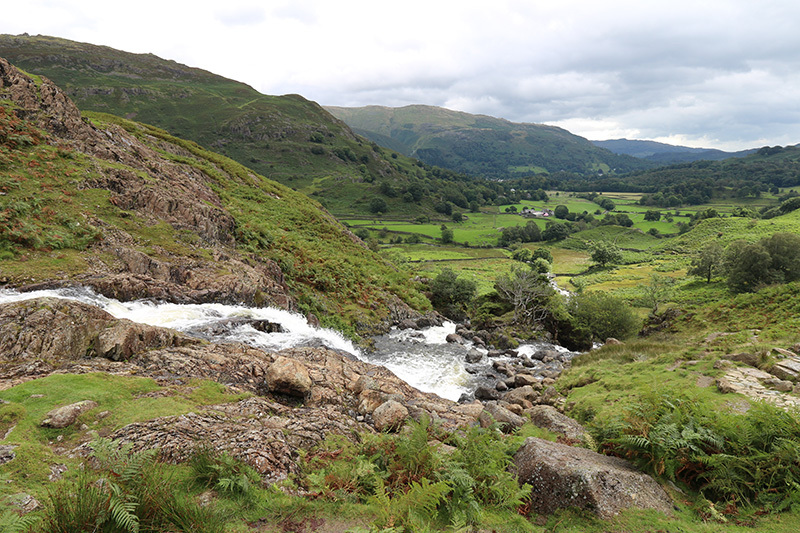 Sour Milk Gill looking back towards Grasmere. We arrived mid-morning on the Sunday and set off from Red Bank car park in Grasmere at 11am, headed for the Langdale Pikes, the idea being to pick up Tarn Crag on the return leg. The weather looked promising and the outward journey via Easedale Tarn and Belles Knot to Sergeant Man was beautiful. We ate our lunch from a perch above Belles Knot, looking back over Codale and Easedale Tarns. 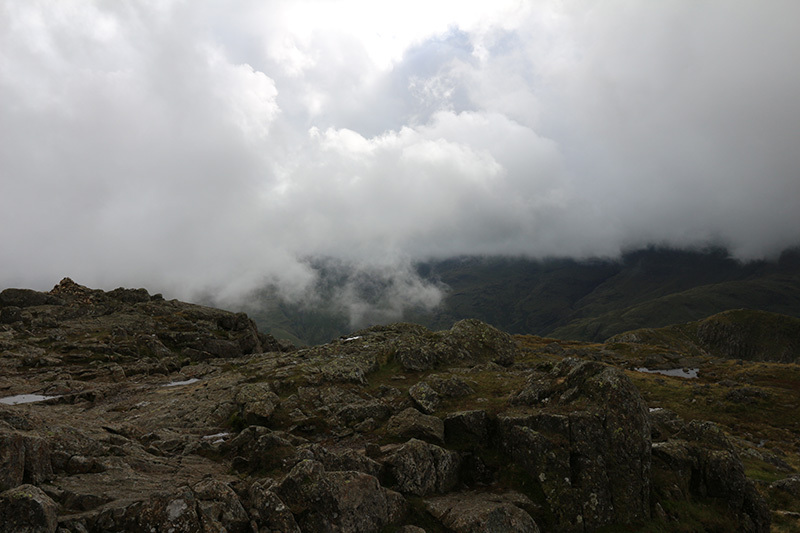 By the time we reached Sergeant Man, the cloud base had got lower and some of the tops in the distance were hidden by mist and cloud but our route was clear and both Pavey Ark and Harrison Stickle were within easy reach, so we set off. We walked along the curving ridge path to Pavey Ark and were rewarded by clear views down to Stickle Tarn and across to the other Langdale Pikes. The same was true when we reached Harrison Stickle (my favourite fell name) and at this point it seemed as though we would achieve our objective for the day. The conical form of Belles Knot from the path above Easedale Tarn. However, everything changed en route to Loft Crag. Mist rolled in from the west and reduced visibility down to around 20m. Fortunately, the paths were easy to follow and the GPS mapping on my phone meant we always knew where we were but we still missed the summit of Loft Crag on our first approach. We back-tracked and made the summit, our fourth Wainwright of the day. 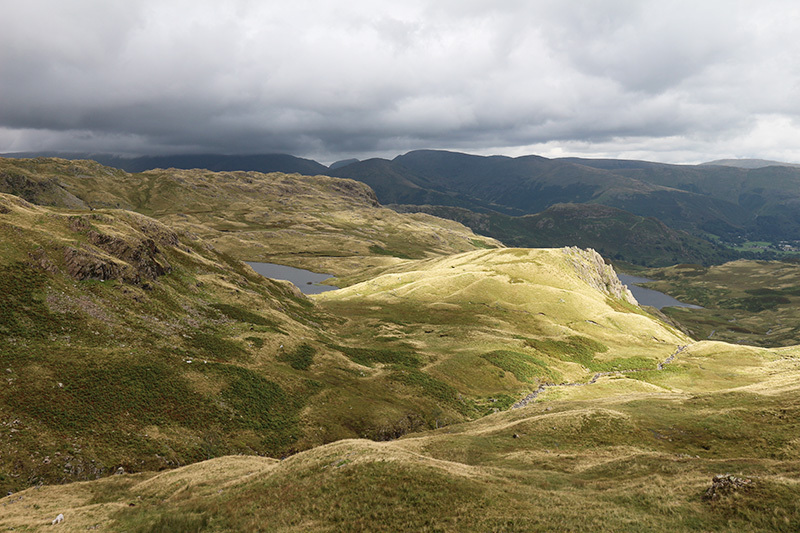 Our lunchtime view of Codale and Easedale tarns with Belles Knot in sunlight. At this point we wondered whether it was sensible to continue in view of the prevailing conditions but since Pike o’Stickle was only 500m away, we decided to go on in the mist. We made the top of Pike o’Stickle after the short scramble onto the rock dome and then decided we should call it a day. 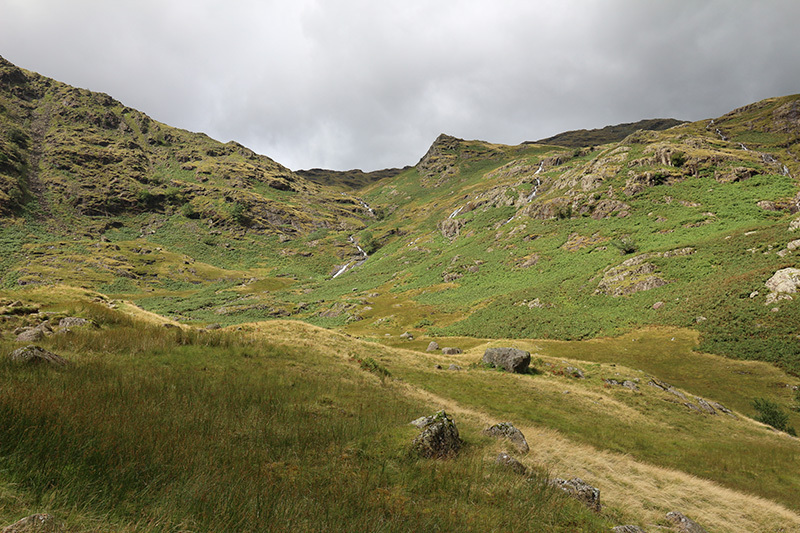 We had planned to pick up Thunacar Knott and Tarn Crag on the return leg but we figured it would make more sense to simply retrace our steps, using now familiar paths, than to try for a route we couldn’t clearly see. Stickle Tarn from the path between Pavey Ark and Harrison Stickle. 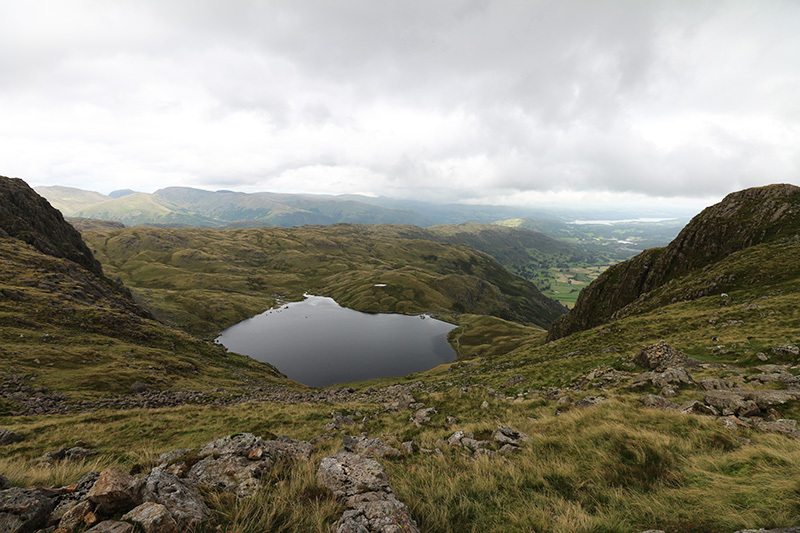 We fairly quickly made it back to Pavey Ark and then set out on the slightly more difficult route to Sergeant Man. Fortunately, there were a few breaks in the mist and we caught occasional glimpses of the easily recognised rock dome. Following the GPS closely, we managed to keep to the planned route and made it back to the base of Sergeant Man. Cloud and mist rolling in from the west as seen from the summit of Harrison Stickle. By this time the mist had begun to clear a little and we could see more of our surroundings but despite our best efforts, we failed to find the route back towards Belles Knot and down to Easedale Tarn. However, I recognised the route followed by the old county boundary, now marked by intermittent steel fence posts and realised that we could easily follow this route, even if the mist became thicker, until it met the Coast to Coast path that would lead us down into Far Easedale and back to Grasmere. That seemed the most pragmatic solution even though it would add an extra mile to our walk. Tilly at the summit of Loft Crag in the mist. It was certainly a relief to make it down into Far Easedale and as we descended, the mist cleared and so did the worry of getting lost. The main concern now was the fading light. Retracing our steps, checking our positions and settling on a longer return route had cost us time and with a heavy cloud-base above, light was fading faster than usual so we had to keep up a good pace to ensure we got back to Grasmere before we needed our torches. Fortunately, everything worked out fine and we arrived back at Grasmere at 8.15pm, still with enough light to go to the Co-Op for a well-earned can of fizzy. I think it’s fair to say that we were both slightly shaken by the experience and some valuable lessons have been learned but it also means that we have unfinished business with the Langdale Pikes. After studying the map, it became clear that we had walked within 200m of Thunacar Knott, and didn’t see it. It’s not a prominent summit even on a clear day but it’s anoying we came so close without bagging it. I also don’t feel like I’ve “done” the Langdale Pikes. 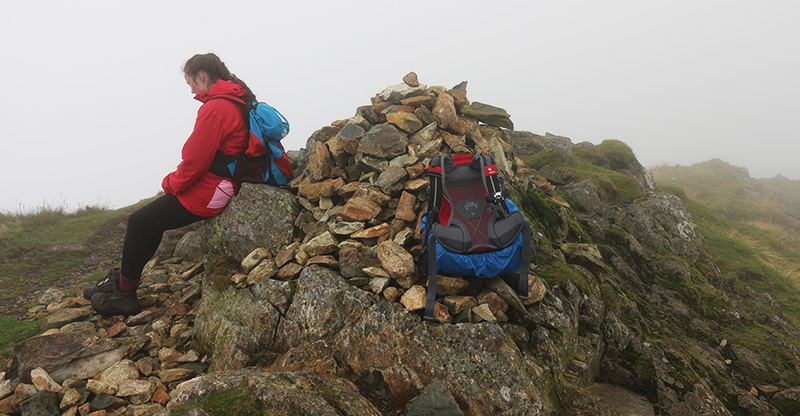 Sure, we visited the summit of both Loft Crag and Pike o’Stickle but we didn’t properly see either of them and there was certainly no view from the tops. So a return visit is definitely on the agenda, if for no other reason than to exorcise the ghosts of this walk. The Langdale Pikes from Loughrigg Fell. On the Monday we had some enforced down time – it poured all morning – and we took the opportunity to spend a few hours reading, knowing that the afternoon forecast was better. 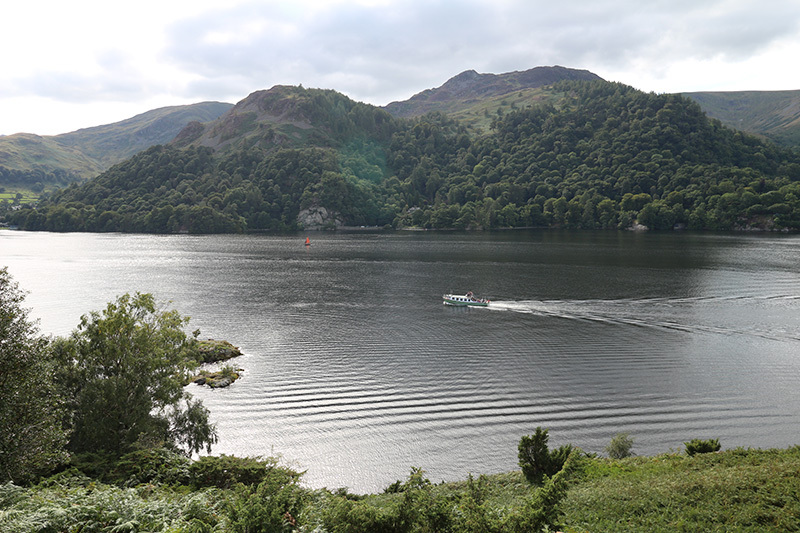 Chastened by the previous days adventure, we decided to keep things simple that afternoon and walked from YHA Ambleside over to Loughrigg Fell, a nice, easy walk to one of the lower fells. 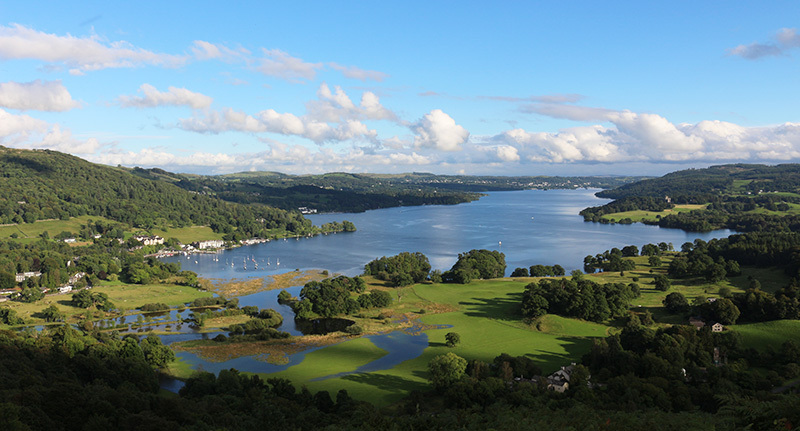 The sky in the east was clear and blue and the rising path from Clappersgate gave great views over Windermere and back to the youth hostel on the far shore at Waterhead. Lake Windermere from the path to Loughrigg Fell. Loughrigg Fell is similar to many fells in that the summit cannot be seen from below and what appears to be the summit is just a lower crag. 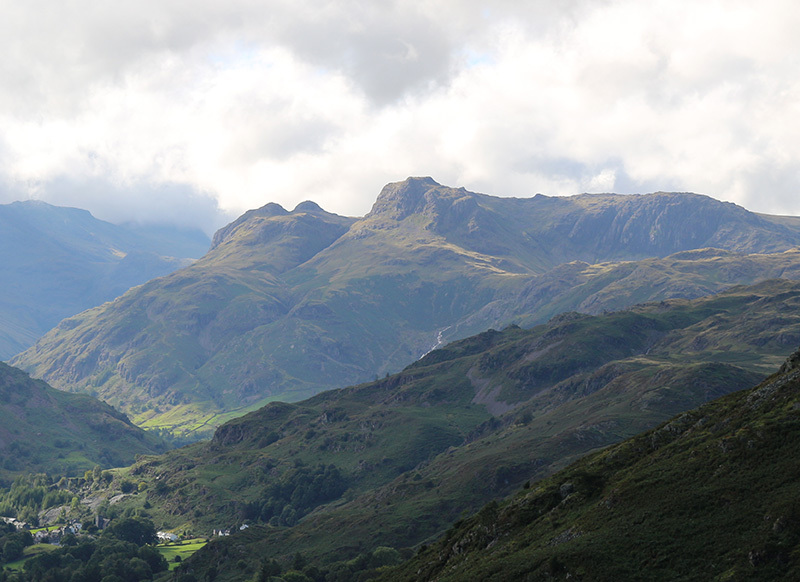 The face of this fell, seen from Ambleside YHA, is Todd Crag with the summit itself being another 2km north-west. When we arrived at the summit we were gifted a dramatic light show as shafts of light burst through rolling cloud above the Langdale Pikes, now clear of mist and beautifully detailed on the skyline. Light over Great Langdale, as viewed from Loughrigg Fell. On Tuesday we headed to Borrowdale to pick up Grange Fell and Great Crag and this offered the opportunity to revisit the object of one of my clearest childhood memories of the Lake District. I last visited the Bowder Stone at the age of 10 and hadn’t been back for over 40 years. Despite the years, the Bowder Stone and its setting looked just as I remembered it. In fact, the only thing that seems to have changed is the interpretation – how it came to be where it is. Traditionally, the 2000 ton boulder was thought to be a glacial erratic and that it came to rest, balanced on one of its edges, by the melting of ice. These days, it’s thought more likely to have fallen from the crag above and come to rest on edge quite by chance. 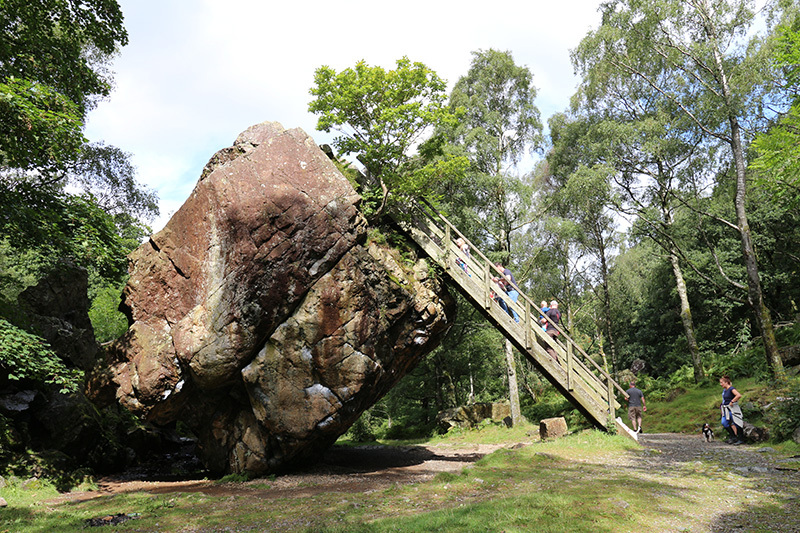 The Bowder Stone, a massive andesite boulder in the Borrowdale valley, now owned by the National Trust. 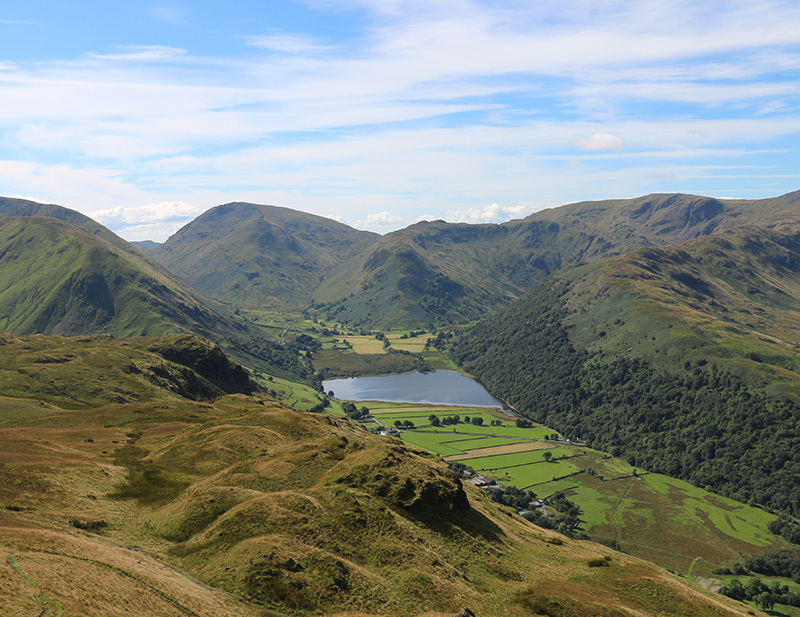 Tuesday was a beautiful day and although the walk (climb) up to Grange Fell from the “Jaws of Borrowdale” was very steep, we were rewarded with fantastic views south-west along the Derwent valley. Above the trees, the fell was purple with heather in bloom, probably the best time of year to see it. We had lunch at the summit and then headed south along the ridge to Great Crag. After some boggy ground, we came to the base of Great Crag and a lovely spot by a cascading beck where we just hung out for a while. The weather was hot and the sound of stream on stone and the feel of cool water on our cheeks was too good to miss. The climb to the summit was steep but mostly pitched and therefore relatively easy. The summit itself was a beautiful place to be and we imagined a technology that would enable us to be transported back there at any time we felt down or in need of inspiration. 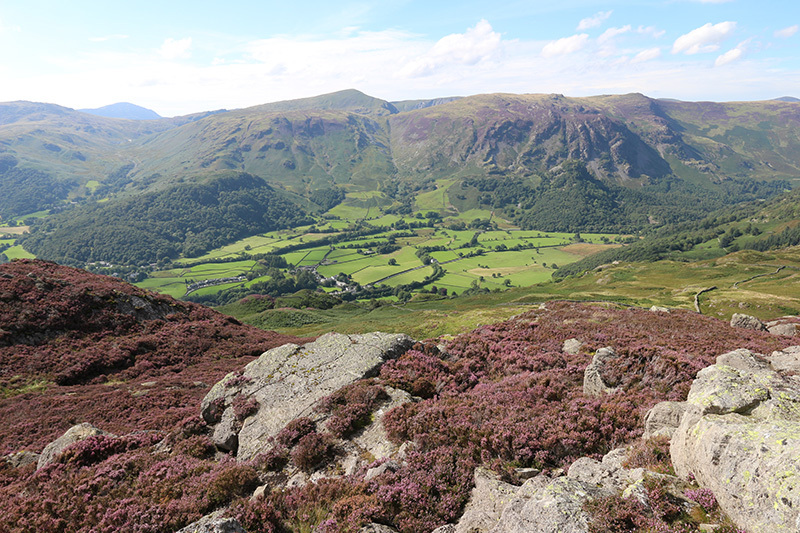 Heather on Great Crag looking towards Borrowdale. We returned to the Bowder Stone car park via Rosthwaite and then finished off a fantastic day with an ice-cream in Keswick. On Wednesday we had planned a big walk – the Kentmere Round – taking in 9 Wainwrights but in light of our experience on Sunday and in view of the fact that we had to drive home that evening (Tilly’s GCSE results were due at 10am the following morning), it seemed sensible to leave that adventure for another time and attempt something more manageable. We checked out of Ambleside youth hostel and drove to Patterdale, intent on bagging Place Fell. It was another lovely day and we set off in good spirits, heading for Boredale Hause. When we arrived at the hause, Angletarn Pikes seemed like not much more than a stone’s throw away, so we headed off south along the route of the Coast to Coast path. We climbed the northern (highest by 2m) of the two peaks and then returned to Boredale Hause to pick up our planned route over Place Fell and along the ridge to Sandwick and returning via the lake shore path. The view south to Brothers Water from Angletarn Pikes. The path up to Place Fell from Boredale Hause is well maintained and the surface is good but it is a steep climb and made for a very sweaty trudge on what turned out to be the hottest day of the year. 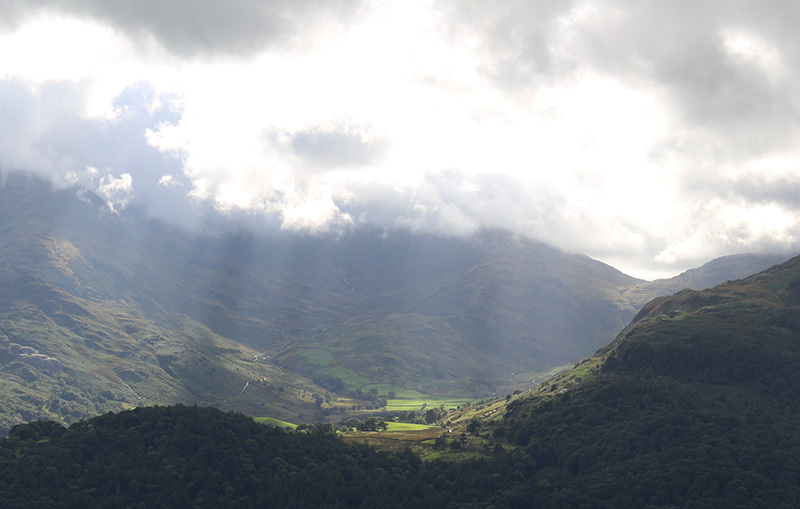 Place Fell is one of the more popular peaks, partly due to its visual prominence from and its proximity to Patterdale. We arrived at the summit at 1pm (lunch time) to find 30 other walkers already munching on sandwiches and muesli bars. 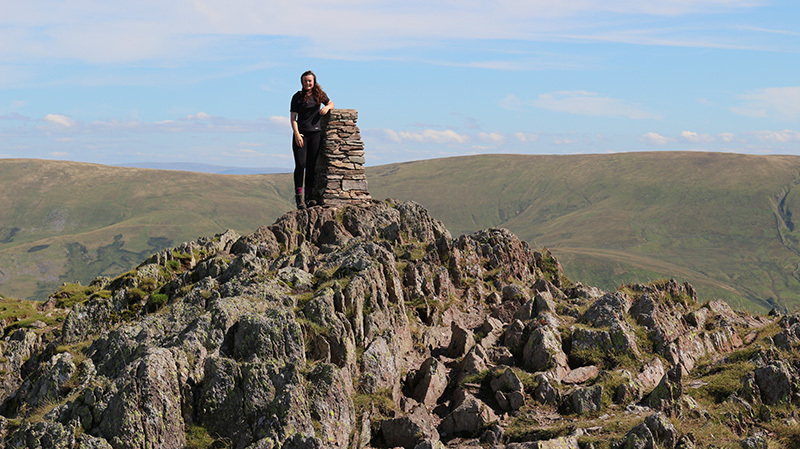 As with many tops in the Lakes, the summit is marked by an Ordnance Survey column built on a rock platform. The position of the column at Place Fell is particularly dramatic since the rock platform is elevated above the general level of the summit plateau. After lunch we headed north and eventually dropped down to the lake path at Sandwick. We (I) was tempted by a quick bagging of nearby Hallin Fell but decided against it. As it turned out, that was a good call because the lake path return route to Patterdale turned out to be a real roller-coaster of a walk with the path rising and falling many times over the two mile stretch. Nonetheless, we arrived back at the car in good time for a loo stop at Glenridding before starting our return journey to Hampshire, arriving home at 10.30pm. View across Ullswater from the footpath along the eastern shore. That completes 59 Wainwrights, pushing through the 25% point and leaving just 155 more. At the current rate, I’m on target to complete the challenge before my 60th birthday, as planned. Up to this point, all the photographs in this journal have been taken with my Sony NEX-6 camera and the E16-50mm power zoom. It seems to me to be the perfect compromise between a compact point-and-shoot and my Canon 6D (way too bulky and heavy for hillwalking). I love the way the NEX handles and the electronic level in the EVF is just brilliant for landscape work. I also love using Panorama mode for sweeping shots of the skyline and I’ve never been disappointed in the quality of the results. However, I’ve never been keen on the lens. Handling is not great (I’d prefer a manual zoom) and the focal length is a little short at the telephoto end. Ideally, I’d like to try the Sony E16-70mm lens in combination with the NEX but at £800 it’s way overpriced. So I’m looking for an alternative and on this trip I decided on something different. I took out my Canon 100D with the 10-18mm and 18-55mm STM lenses. I thought it would make for a compact and lightweight way to work with a DSLR and the opportunity to have an optical viewfinder. The 100D is a lovely little camera that I’ve had for a few years now but the handling just didn’t feel as positive as the NEX with its deep, angular grip, great for one-handed shots. Despite it being the smallest DSLR on the market, the 100D is still twice as deep (front to back) as the NEX. The weight is about the same, so it looks like a trade-off between slightly more bulk and an optical viewfinder versus better handling and a few extra gizmos. Image quality and the convenience of processing the results is another factor. Obviously, there’s no Panorama mode on the 100D but a series of frames can easily be stitched together using Photoshop’s Photomerge tool but that’s another step in the workflow. Similarly, some people may feel that the Sony approach to in-camera processing like the auto HDR feature takes away the freedom of the photographer and may well prefer the more basic Canon approach. Personally, I’ve always had great results from the NEX and don’t feel I’ve been taken out of the loop. By comparison the 100D photos seemed relatively flat and required more work although the Landscape scene mode gave very similar results to the NEX. Of course that could, in part, be a result of the cheap lenses I was using but I also felt the dynamic range of the 100D just wasn’t a match for the NEX. I’m glad I tried the Canon kit but I think I’ll be returning to the Sony for the next trip and just keep lusting after that perfect E16-70mm lens. My walking boots have taken a bit of a battering over the past few months but I wasn’t expecting a catastrophic failure anytime soon. 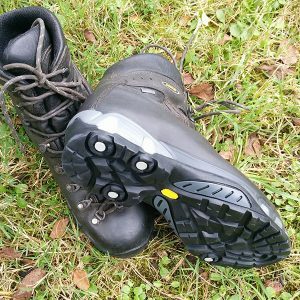 On the last day I noticed that the soul had begun to come away from the boot and they very quickly deteriorated during the walk so that by the time we finished, they were only just attached. They are 6 years old but I’m really surprised by the speed of failure, they looked and felt perfectly good at the start of the week. Update: I considered buying a new pair of boots but it seemed a shame to ditch a good pair of boots with leather that was worn-in and supple just because the outsole was falling off. 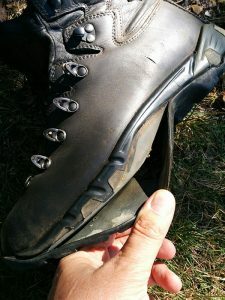 I investigated repair options and discovered Lancashire Sports Repairs (actually, the only real option) and sent off my boots along with a cheque for around one third the price of a new pair. The boots have just been returned and look great. I have a brand new original Vibram mid and outsole on a comfortable pair of boots already moulded to my feet. Potentially better than a new pair at one third the cost. Very good service from LSR and highly recommended. With luck I’ll get another 5 or 6 years of wear out of these boots.